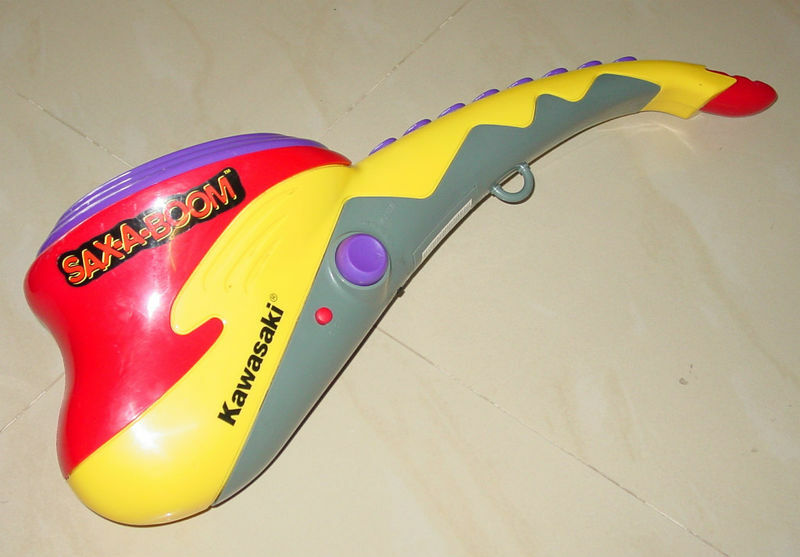 The Sax-A-Boom was formerly sold by DSI Toys. 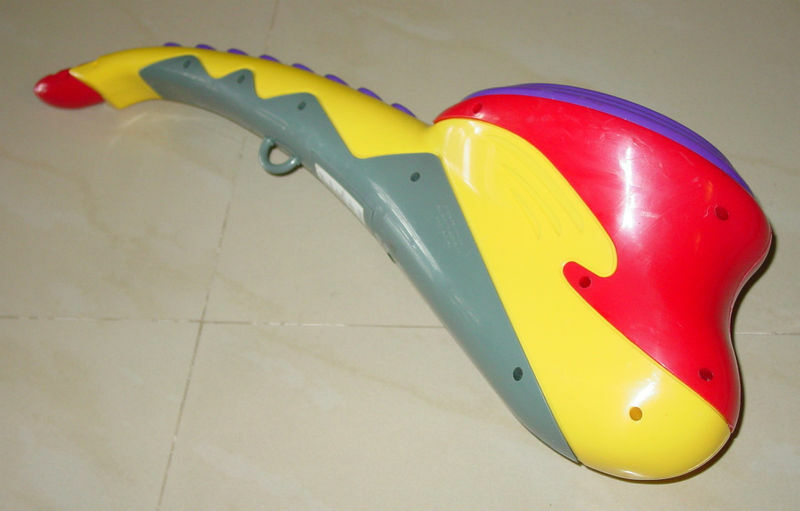 This interesting saxophone-shaped toy, plays pre-recorded licks accompanied by a variety of backing tracks. Pressing the buttons on the front plays the different licks, which you can use in any combination to create your own song. And yes, it does sound remarkably like a saxophone. Because of Jack Black’s use of this electronic toy, some owners of a Sax-A-Boom try to sell their horns for ridiculous amounts of money. Get over yourselves people. They were cheap toys. This one was one of the more reasonably priced ones that sold on eBay in June 2014 for $39.99 (still basically double the original price), and it was missing its neck strap. Nearly a year later this Sax-A-Boom appeared on the UK eBay site. The seller advertised it still contained its original batteries. I think we can figure out how the inside of the battery compartment is going to look! Nonetheless, these eBay pics show this electronic toy saxophone’s original packaging. This toy saxophone was made famous by Jack Black’s use of it in live performances with Tenacious D—a band that he fronts together with Kyle Gass. Because of Black’s use of the Sax-A-Boom on stage, examples of this sax-shaped “thing” (when in good condition) are listed on eBay regularly for amounts greater than $50. It’s not uncommon for sellers to list them for over $100. IMO, that’s just crazy. The Sax-A-Boom sold for around $20 new, around the late 1990s. I know, because I bought one. Unfortunately because of a slight bit of miscommunication, mine was given away to a friend’s daughter, while I was on a business trip. The little girl liked it so much, I didn’t have the heart to ask for it back when I got home.